In their excitement over the delicate marzipan flavor of cherry pits, people often overlook the dark crimson fruit that surrounds them. But did you know that the flesh of the properly-ripened cherry — firm, sweet, and succulent — is actually quite good in its own right? In some cultures, the cherry fruit itself is even more prized than the stone cached within. These scones, although they do contain fruit and a small amount of sugar, are not what I would call sweet. 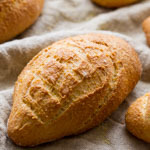 If you’re feeling adventurous, make your cornmeal the coarsely-ground variety and give your teeth the workout they thought they’d never get from a scone. The scones maintain a good shape if they are formed in a cake ring, frozen before cutting into wedges, and frozen again before baking. I like this adjustable-size ring because it’s very versatile, but you can use a plastic-wrap-lined cake pan if you don’t have one. 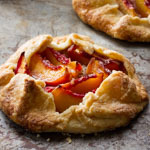 Layering the fruit with the dough, rather than mixing it in, helps the fruit stay intact. 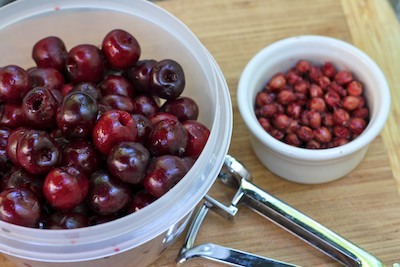 And a cherry pitter makes short work of separating the stones (seriously, don’t throw them away!). Spray an 8-inch round cake ring with baking spray, or line an 8-inch cake pan with plastic wrap. 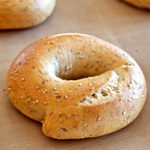 Place the ring or pan on a parchment-lined baking sheet. Sift the flour, cornmeal, sugar, salt, and baking powder into the bowl of a stand mixer. Add the cold cubed butter and mix with the paddle on medium-low speed until the butter pieces are the size of small peas. Combine the buttermilk and 110 g of eggs, and add them along with the pine nuts to the bowl. Mix on low speed just until combined. 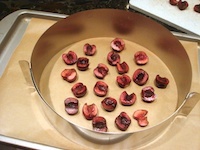 Scatter half the cherry halves over the bottom of the pan or within the ring on the parchment paper. Don’t let them get too close to the edge. Spread half of the dough evenly over the cherries. Layer on the remaining cherries and the remaining dough. 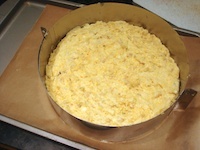 Make sure the dough fills in evenly around the edges of the pan. Freeze for one hour. Flip the dough disc out onto the parchment paper (removing the ring or the pan and plastic wrap) so the first layer of cherries is now on the top. Cut the disk into 8 wedges. 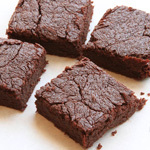 Space them evenly on the parchment-lined pan and return to the freezer for 30 minutes. Meanwhile, preheat the oven to 375F on the convection setting, or to 400F if convection is not available. Just before baking, beat the remaining egg in a small bowl with a dash of water and a pinch of salt. Brush a light coat of egg wash onto the tops of the scones. Bake for about 20 minutes, until the scones are golden brown. Almonds + cherries totally appeal to me. 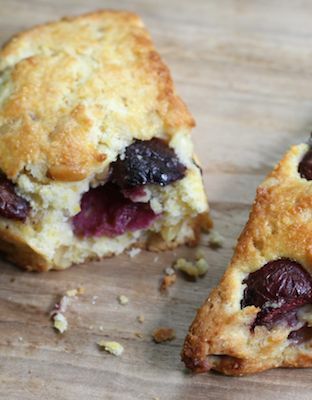 Did you use sweet or sour cherries in your scones? Lovely scones, the pine nuts surely making it more delicious. Yum! I don’t really like pine nuts in savory foods because they don’t seem to add much flavor, but I can see how they would be really good in baked goods. It seems like they would add a creaminess and richness. Thanks for the recipe. 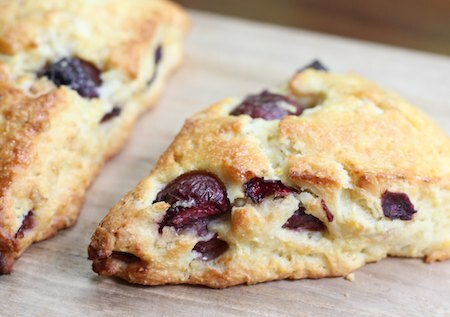 Beautiful scones and those cherries make me drool. What a clever way of getting your shapes perfect by using the baking pan. Good trick. This look sso good! Thanks for the post…..
Oh, lovely. How wonderful that I was brought to this post. You have reminded me that it has been far too long since I last made scones. I’m always up for making something to go with my coffee. 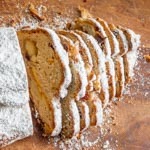 Being a scone purist, I would only put currants and nutmeg into scone dough. However, I’m not a quickbread purist and these so called scones of yours (I do hope I don’t have to explain that I’m mocking myself here) made with cherries and pine nuts look and sound delicious. Good idea to use a form to make the shape round. We’ve always just hacked scone dough into rough diamonds. Did you use Bing cherries? Very delicious looking! Where’s the pot of hot tea (smile)? I am digging the combo of cherries and pine nuts. I just happen to have some already pitted fresh cherries in my freezer that I stashed away a month ago. I think they’ll be perfect in these lovely scones. Ahh, I love scones, especially when they’re not overly sweet; I can’t stand those sugar laden “scones” you find at grocery stores. These look delightful, perfect for my afternoon tea! I have never attempted to make scones before I always just used to pick some up at our local cafe but recently it went out of business. It so sad when things like this happen to small businesses with a ton of history. So I figure its time to try to make some on my own. 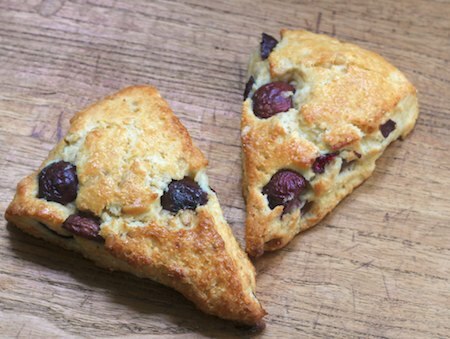 I’ve never been that big of a fan of cherries but I do like them in scones for some reason, so when I stumbled across this recipe I was thrilled. 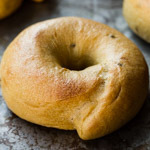 I work with Better Recipes so I always appreciate good Breakfast Recipes and I just can’t wait to try this one! These looks so amazing! Bet they tasted delicious too! 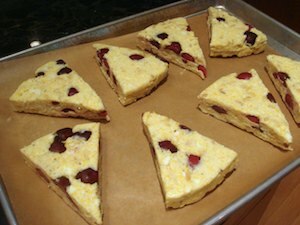 Interesting recipe and awesome-looking scones!